After posting my Spotlight cake, commented saying saying she'd had trouble with the MMF. I'd heard a lot of people say the same thing in the past. So here's a blow by blow account how I do it, with pictures included. Disclaimer: I always cook by feel, rather than exact quantities. Fondant especially cannot be measured accurately. Hence, I cannot give you exact amounts, but I can give you a rough ratio from which to go by. Start by getting everything ready: Fondant dries in the air quickly, so the last thing you need is to be scrambling last minute for utensils or ingredients. The ingredients are pretty basic. If you are flavouring the fondant, get you colours and flavours ready. Now, for quantities. It is roughly a ratio of 1 cup marshmallows : 2 cups icing sugar. IMPORTANT: When measuring, be sure to squish down the marshmallows, otherwise you will be under measuring. I use the jumbo pack of Pascals marshmallows. A mix of pink and white, cause I can't find pure white anywhere. Pre-coloured/flavoured marshmallows are great if you happen to want that colour of fondant. Otherwise, they're just a pain. I separate the colours and leave the pink ones for other desserts or dunking in hot chocolates. Conveniently, the amount of marshmallows in this packet equates to exactly 2 cups. 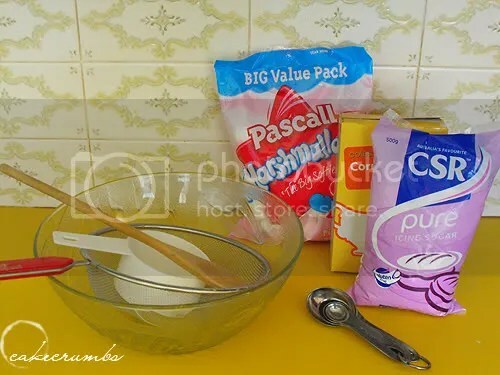 Even more convenient is that it needs almost exactly 1 packet of CSR pure icing sugar (500g net), which is about 4 cups. So all you need (this will differ in other countries) is one pack of marshmallows and one pack of icing sugar to make one batch of fondant. Easy to remember, huh? You can half/double this quantity as per your requirements. Okay, enough blabbing and more fondant…ing? Put the 2 cups of marshmallows in a microwave safe bowl with 1 tablespoon of tepid water. Zap it at 30 second intervals, stirring in between, until mixture becomes soupy (see above picture). And I mean soupy. Not just melted, it has to be literally runny. If you want to flavour/colour your fondant, now is when you can do it. But I always need white and several smaller lots of random colours, so I always colour after the jump. Now sift in your icing sugar a cup at a time and combine with your wooden spoon. Do not use your hands. You will burn the living crap out of them. I have lost count of the amount of times I have read complaints about burns from making marshmallow fondant. Just don't do it. Sift in the icing sugar a cup at a time: stir in the icing sugar with your spoon until you can't any more. It will become really tough and physical toward the end. Use your spoon to knead it when this becomes the case. You will get tired arms, but believe me, it is better than finding your arms have been swallowed by sticky fondant. I can knead it to near completion with a spoon. There are no photos of this point, because my hands were covered in icing sugar and I'd like my camera to stay not wrecked. Once you cannot knead it any longer, get your fingers into it. 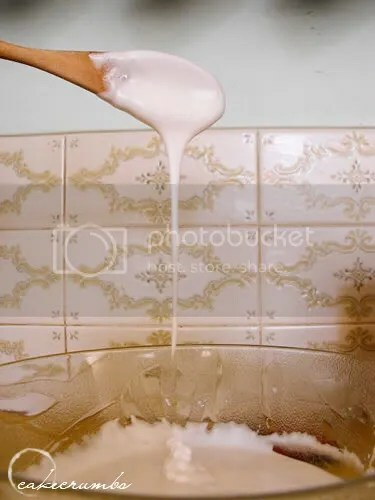 By this stage you should not have used all 4 cups of icing sugar: you probably would not physically have been able to work the rest of it in with just the spoon. You will probably have worked in about 3 to 3 1/2 cups of icing sugar thus far. The fondant should only be slightly sticky, but in the case it is more than this, have your excess icing sugar at the ready in case your hand gets glomped by fondant anyway. To avoid mess, knead it one handed inside the bowl: this frees up one hand should a moar-sugar-rescue-mission be needed. If you've worked it enough with the spoon, it should be perfect to start kneading by hand. By the end of this step, it will look like above. 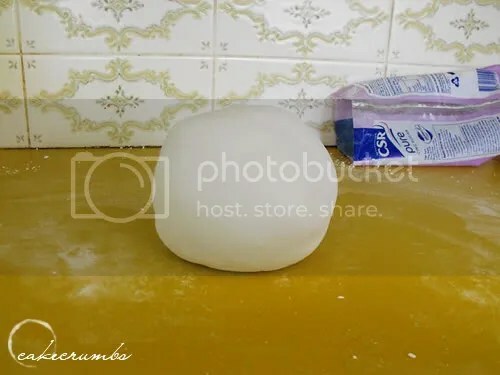 Put your ball of fondant on top and gradually knead the icing sugar in until it is elastic, smooth and no longer sticky, keeping your hands well dusted as you go. IMPORTANT: Do not work in the icing sugar until it is completely dry. It will crack and you'll never get it to smoothly cover you cake. Your fondant will remain very very slightly sticky. 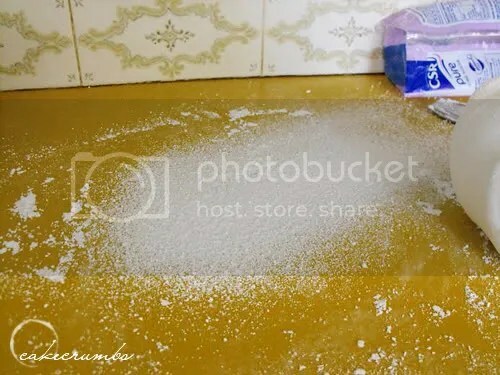 This is why you need to dust your work surface with cornflour (I believe this is called cornstarch in other countries). It will stop your fondant from sticking to everything. 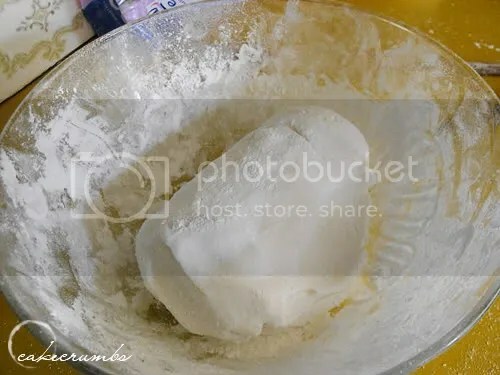 If you dust with icing sugar, one of two things will happen: you will work in too much icing sugar and your fondant will become dry and cracked; or it will become sticky and stick to your work bench/tools/hands. This is why it is important to do it by feel rather than by measurement. The amount of sugar needed will depend on a plethora of things, even your climate. The last time I did it, I used the entire bag of icing sugar. This time, I had a handful left over. If you don't know what fondant should feel like, go buy some pre-made stuff and have a play before attempting to do your own. You'll very quickly pick up the gist of it. Now you are ready to roll and colour and mould to your heart's content. If colouring, ALWAYS used gel/powder colours. NEVER use the liquid stuff. It will wreck your fondant. Trust me, I started off using liquid fondant and dusting with icing sugar (more for lack of having the right stuff than anything) under the notion of "how much worse could it be?" The answer is VERY BAD. As long as you have gel colours and dust with cornflour, you will avoid the two biggest fondant disasters most people encounter. 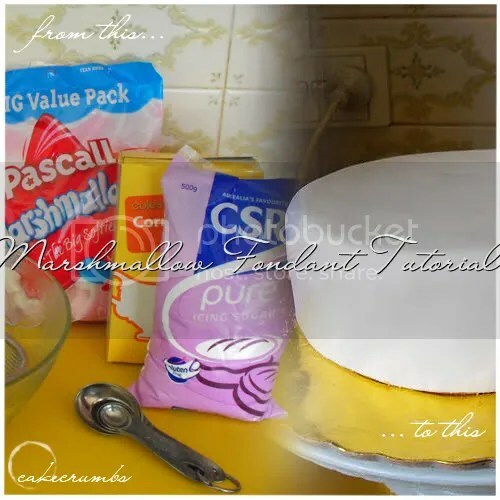 MMF is very forgiving and will roll fairly thin without the constant need for re-dusting that usual fondant does, but still be wary of it: shift the fondant and re-dust your work surface as appropriate. Lastly, always remember to cover your excess fondant with plastic to protect it from drying out as you work. Anything unclear? Ask away and I will get back to you ASAP. I’ve not tried fondant yet, but I have every intention of doing so in the future and have bookmarked this. Thanks! Awesome. 🙂 Hopefully your first try is a success! If you’re covering a cake, I’d recommend MMF. But if you’re going to mould figures etc, I’d go the regular stuff. MMF isn’t great for moulding. I can testify that this marshmallow fondant tastes great! I need a good fondant recipe. The kind I tried to make myself turned out really greasy and WAY too sweet – I don’t remember the recipe exactly, but it called for a lot of shortening and powdered sugar. it was easy to make, but not very satisfying. If i need to make fondant again, I will definitely be using this – i just have to find the right kind of sugar. Oh I’m so glad this could help you. I know a few people have tried this tute recently and had great success: I hope it brings you the same. I just made this, my first attempt was an utter disaster as I did not melt till soupy. I know you clearly told me to!! 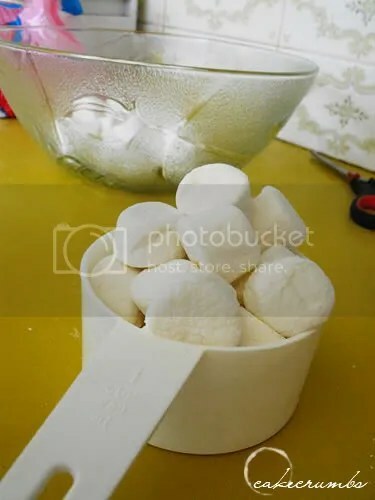 But I did not give up and had patience melting the marshmallows and I’m very proud to say it worked, I’ve never used ready rolled fondant but have eaten plenty of it so I hope I’ve made it till the right consistency. Thank you for the detailed tutorial was very helpful, I kept coming back to refer to it as necessary. I have read a few how to that were from the US so was good to see Australian products to know I had the right stuff, and to read that I’d burn the living crap out of my fingers was very helpful :p Thanks again, here’s hoping I can turn my ball of fondant into some flowers and baby booties!!! Thanks so much for posting this tutorial. I used it to make a cake for my niece this week and the fondant was great. It tastes good and was easy to make. I just need to practice getting it on the cake! Thank you for the feedback. :] It is truly a pleasure to hear that this helped. Fondant does take a bit of practise – my first attempts were nothing short of a disaster! But it only gets easier from here! Also, what happens if you use an icing sugar with corn starch in it? I can’t find any pure confectioner’s sugar here in the states, all the organic ones have tapioca starch added to them.. I do have a vitamix blender so I could attempt to make some from scratch? As for the above, 2:1 is probably about right. So much affects how much icing sugar you need, especially the weather/humidity. Always add less – it’s much easier adding more sugar to a sticky fondant than trying to work out how to recover a dry and cracked one. Thanks for the tutorial! 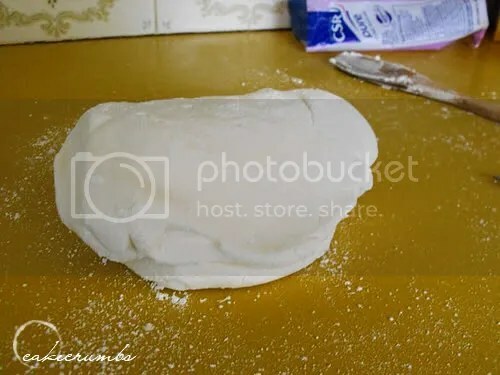 I am going to try to make my first batch of fondant this weekend — here’s hoping it turns out! Do you know about how big of a piece of rolled fondant you get from one batch/recipe? I’m going to cover a 2-layer 9″ cake and I’m not sure if I will need the whole batch or if I should just make a part batch. Good question! You know I’ve never measured. I usually cover a standard 8-9 inch cake with one batch, and I roll it pretty thin, so it should be fine. I’m yet to post one, but for flower modelling petal paste is even better. You can buy it from most cake decorating stores if you don’t want to make it yourself. It’s also think it’s better to buy the first time you use any of that stuff so you know what it’s supposed to feel like.